Add some curb appeal to your property. 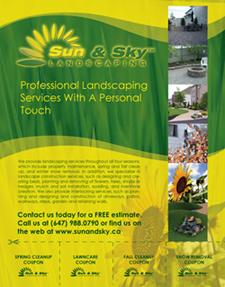 With Sun And Sky's landscape construction service you can transform and beautify your property. Whether it's for personal gratification or preparation for a real estate showing, investing in our landscaping construction services will add value to your property by adding beauty as well as functionality to it. From planning to design, Sun And Sky can handle all your lanscape construction needs from start to finish. We specialize in designing and creating flower beds. We can also handle any planting or removal of flowers, trees, hedges, shrubs. mulch. We also specialize in complete lawn care. From fertilization to seeding to complete re-sodding.